Heavenly Father, almighty God, we thank You for the gift of salvation made possible by Jesus’ willing and obedient sacrifice upon the cross in payment of our sins. We praise You for the power of the resurrection demonstrated by Jesus overcoming death’s grip on Him. We glorify You for the promise of eternal life in Your holy presence through faith in Jesus. It is in His name that we pray. Amen. 2 And behold, a severe earthquake had occurred, for an angel of the Lord descended from heaven and came and rolled away the stone and sat upon it. 3 And his appearance was like lightning, and his clothing as white as snow. 4 The guards shook for fear of him and became like dead men. 4 Looking up, they saw* that the stone had been rolled away, although it was extremely large. 5 Entering the tomb, they saw a young man sitting at the right, wearing a white robe; and they were amazed. 7 “Go quickly and tell His disciples that He has risen from the dead; and behold, He is going ahead of you into Galilee, there you will see Him; behold, I have told you.” 8 And they left the tomb quickly with fear and great joy and ran to report it to His disciples. 8 And they remembered His words, 9 and returned from the tomb and reported all these things to the eleven and to all the rest. 10 Now they were Mary Magdalene and Joanna and Mary the mother of James; also the other women with them were telling these things to the apostles. 11 But these words appeared to them as nonsense, and they would not believe them. 3 So Peter and the other disciple went forth, and they were going to the tomb. 4 The two were running together; and the other disciple ran ahead faster than Peter and came to the tomb first; 5 and stooping and looking in, he saw* the linen wrappings lying there; but he did not go in. 6 And so Simon Peter also came*, following him, and entered the tomb; and he saw* the linen wrappings lying there, 7 and the face-cloth which had been on His head, not lying with the linen wrappings, but rolled up in a place by itself. 8 So the other disciple who had first come to the tomb then also entered, and he saw and believed. How did/should Jesus’ death and resurrection profoundly impact His disciples? Jesus was crucified and died upon the cross on Friday. Because the Sabbath would begin at sundown and dead bodies were not to be left out in the open on the Sabbath, Joseph of Arimathaea and Nicodemus hastily removed and anointed the body and placed it in Joseph’s unused tomb. 42 When evening had already come, because it was the preparation day, that is, the day before the Sabbath, 43 Joseph of Arimathea came, a prominent member of the Council, who himself was waiting for the kingdom of God; and he gathered up courage and went in before Pilate, and asked for the body of Jesus. 44 Pilate wondered if He was dead by this time, and summoning the centurion, he questioned him as to whether He was already dead. 45 And ascertaining this from the centurion, he granted the body to Joseph. 39 Nicodemus, who had first come to Him by night, also came, bringing a mixture of myrrh and aloes, about a hundred pounds weight. 40 So they took the body of Jesus and bound it in linen wrappings with the spices, as is the burial custom of the Jews. 41 Now in the place where He was crucified there was a garden, and in the garden a new tomb in which no one had yet been laid. 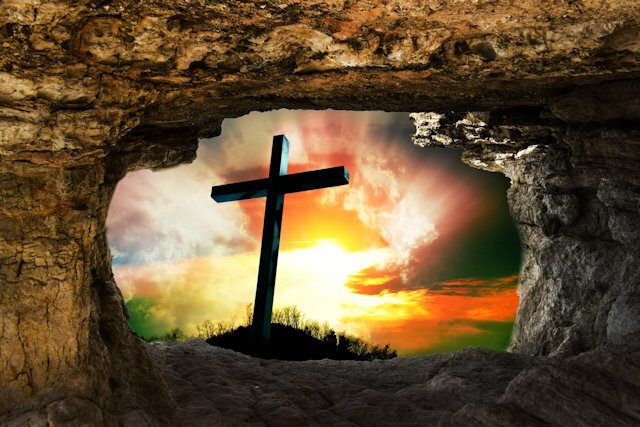 Matthew 27:60 (NASB) 60 and laid it in his own new tomb, which he had hewn out in the rock; and he rolled a large stone against the entrance of the tomb and went away. 54 It was the preparation day, and the Sabbath was about to begin. 55 Now the women who had come with Him out of Galilee followed, and saw the tomb and how His body was laid. 56 Then they returned and prepared spices and perfumes. And on the Sabbath they rested according to the commandment. As a result, Mary Magdalene and others wanted to properly anoint Jesus’ body as soon as possible, which would be sunrise Sunday, the day after the Sabbath. 4 Looking up, they saw* that the stone had been rolled away, although it was extremely large. Forgetting Jesus’ prophecies regarding His resurrection because they were still stricken with grief over His recent death and focused on giving Him a proper burial, they arrive at the tomb, expecting to find Jesus’ body. Being reminded of Jesus’ prophecy regarding His death and resurrection, and seeing the tomb empty, except for the angel, they are filled with joy and excitement as they run to bare witness to the other disciples as instructed. 8 And they remembered His words, 9 and returned from the tomb and reported all these things to the eleven and to all the rest. Even so, not everyone was quick to believe the women’s story. 10 Now they were Mary Magdalene and Joanna and Mary the mother of James; also the other women with them were telling these things to the apostles. 11 But these words appeared to them as nonsense, and they would not believe them. Even after Peter and John believed, it took many appearances by Jesus before the rest of the disciples began believing. 19 So when it was evening on that day, the first day of the week, and when the doors were shut where the disciples were, for fear of the Jews, Jesus came and stood in their midst and said* to them, “Peace be with you.” 20 And when He had said this, He showed them both His hands and His side. The disciples then rejoiced when they saw the Lord. In Thomas’ case, he still needed physical evidence. Holy God, be merciful to me: a sinner. Please forgive me. I want Jesus to be my Lord and Savior. and conquered death so that I could have eternal life. Help me to live for You from this day forward. Heavenly Father, Jesus died through crucifixion, was buried, and resurrected on the third day so that anyone who believes upon His name and confesses Him as Lord and Savior will receive the gift of eternal life. Dear Lord, we pray that if there is anyone who does not know You as Lord and Savior the Holy Spirit would convict their hearts until they come to that saving knowledge and express it through faith in You. Dear Lord, we pray that those who already know You as their personal Lord and Savior would be convicted by the Holy Spirit to seek a more intimate relationship with You. May Your name be glorified in all for it is in Your name that we pray. Amen. Previous PostPrevious Rejoice! What Once Was Lost Now Is Found!